Matthews Buses Commercial is pleased to welcome back Lewis County General Hospital as a new bus customer. 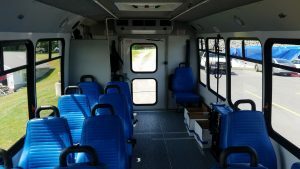 Rich Solano, Commercial Sales Consultant (NY), worked directly with key support staff and drivers to design a custom 2017 Elkhart Coach ECII commercial bus within budget to handle the needs of the critical adult day care program. 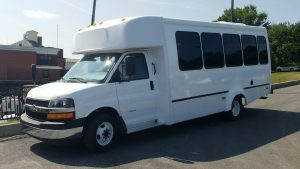 – Severe duty climate control package (2 – 65,000 BTU heaters with insulated lines) and cooling (70,000 BTU rooftop ACT CR-2 system) to ensure passenger comfort year round, and long term performance of the air conditioning system. Temperatures in Lewis County-area vary from an average low of 9 degrees, to average high of 80 degrees. It is not uncommon for temperatures to be in double digit negatives during the winter! – Corrosion-resistant composite exterior, composite rubrail line, metal floor bellypan, and stainless steel rear bumper. Lewis County-area averages over 100 inches of snow annually. Winter road treatment chemicals take a toll on aluminum and steel exterior commercial buses within months. 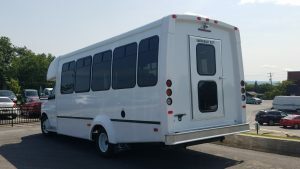 Whether you are looking for commercial vehicles custom designed to your operation, or a stock unit for immediate delivery, Matthews Buses Commercial is prepared to exceed your expectations.